CAMLA celebrated end of year drinks on Thursday 20th November. It was a great night kindly hosted by Henry Davis York on their fabulous rooftop. Here is the speech from our 2014 President, Page Henty (General Counsel, RACAT Group). Page will be continuing in the role as CAMLA President in 2015. CAMLA Young Lawyers representative, Alex Morrissey, recently caught up with two experienced lawyers working in sports broadcasting, Michael Rowe and Tim Holden to chat about some key issues facing the industry and some tips for young lawyers wanting to move into sport or media organisations. Tim Holden is the Senior Legal Counsel (Commercial) at Football Federation Australia. 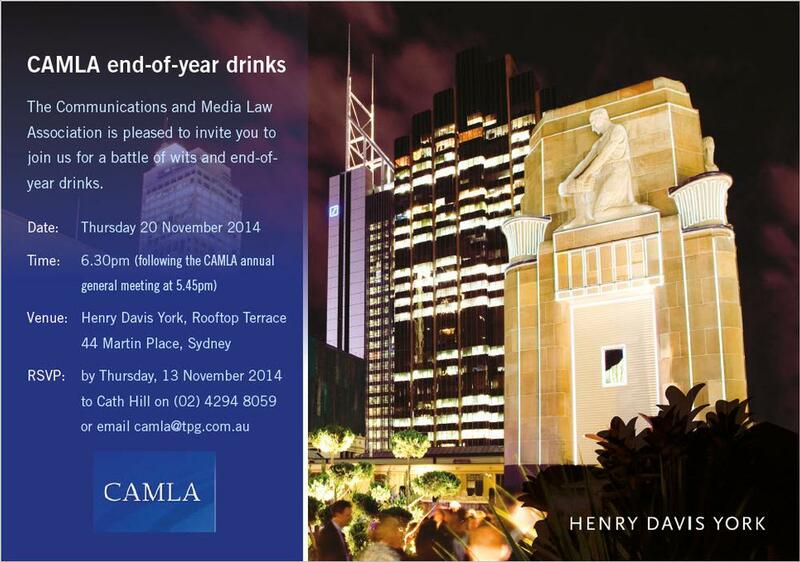 The latest Communications Law Bulletin is available to CAMLA members. A useful privacy checklist from Allens. Thank you letter from CAMLA Founder, Mark Armstrong.